Childhood cancer is a race. Each child that is diagnosed, and their parents and caregivers race against the clock. They race to find effective treatments to stop the advance of the cancer. They race to maintain financial stability. It is a marathon, not a sprint. I've finished 11 full marathons, that's 26.2 miles, numerous half marathons and numerous triathlons. These races do not compare to the race that each child with cancer and their families are running. I Run 4 The Gold is a unique opportunity to take your daily running, walking, cycling, swimming, you name it, and create action aimed at helping children with cancer and furthering the Max Cure Foundation's mission. I'll be competing in my next event on September 18, 2016. A short triathlon. The run portion, the last leg of the race, is a 3.1 mile run (5k). 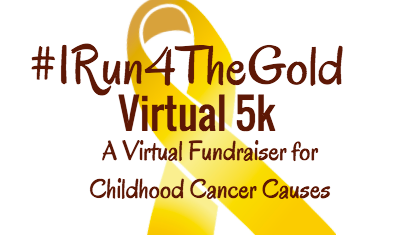 That will be my "I Run 4 The Gold" for my team, Team Alexis, in memory and honor of my hero, my daughter Alexis who was taken from this world in 2011 by childhood cancer. Create a team, join a team, join my team (Team Alexis), donate, have your friends and family join you in your efforts. Help the children facing this race never race alone. Stay tuned for updates and videos and possibly some training information as well.